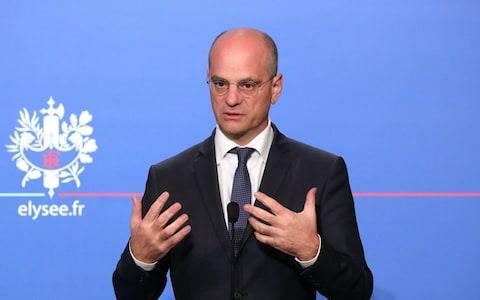 "These days the children don't play at break time anymore, they are just all in front of their smartphones and from an educational point of view that's a problem," said Jean-Michel Blanquer, the French education minister. France is going to impose a total ban on students from using mobile phones in primary and secondary schools starting in September 2018. . In France, some 93 percent of 12 to 17-year-olds own mobile phones. Emmanuel Macron expressed his intention to ban mobile phones in schools in his manifesto before his election as French president in May. "These days the children don't play at break time anymore, they are just all in front of their smartphones and from an educational point of view that's a problem," said Jean-Michel Blanquer, the French education minister. "This is about ensuring the rules and the law are respected. The use of telephones is banned in class. With headmasters, teachers, and parents, we must come up with a way of protecting pupils from loss of concentration via screens and phones," he said. "Are we going to ban mobile phones from schools? The answer is yes." Notably, Phones are already forbidden in France, but from the next school year, students will be allowed to use them in breaks, lunchtimes and between lessons too. Teachers and parents have different views over the ban. According to some Studies, a significant number of students in France use their mobiles in class and receive or send calls or text messages. "We are currently working on this [ban] and it could work in various ways," said Mr Blanquer. "Phones may be needed for teaching purposes or in cases of emergency so mobile phones will have to be locked away." Earlier this year, he suggested that if French politicians were able to put their phones away during the council of ministers meetings, then surely it was "possible for any human group, including a class" to do the same. "A box placed on the table at the entrance to my class awaits mobile phones. I have never had any problems. It takes two minutes at the start of each hour. This was already the case in primary schools I worked in Paris," one teacher based in Rueil-Malmaison told Le Figaro. One headmaster in Marseille, southern France, said he remained unconvinced but this "so-called miracle solution", saying that phones could get mixed up, lost or stolen. "If they are switched off at the bottom of the bag, then it works," he said. Peep, one of France's biggest parents' associations, has already expressed skepticism. "We don't think it's possible at the moment," said its head, Gerard Pommier. "Imagine a secondary school with 600 pupils. Are they going to put all their phones in a box? How do you store them? And give them back at the end?," he asked. "One must live with the times. It would be more intelligent to pose rules and discuss their meaning with pupils," said Peep, pointing out that "adults themselves are not always exemplary with mobiles".